THE wait is over — short selling is back again for all investors. For some veterans, it has been a long wait of more than two decades since a ban was imposed on it in 1997 as a result of the Asian financial crisis. Last Monday, Bursa Malaysia officially introduced intraday short selling (IDSS). However, not all stockbroking firms are on board yet. Before IDSS, Bursa reintroduced regulated short selling (RSS) in 2007, limited to licensed proprietary traders and starting with only 100 stocks. On Monday, the stock exchange announced that 280 securities have been made available for short selling. The list will be reviewed every six months. Apart from all 30 FBM KLCI constituent stocks, the eligible stocks are mostly large and mid cap stocks, with the smallest counters having a market value of no less than RM200 million. A quick check shows that since Feb 5, another 18 companies have been added to the list of eligible 280 SBL (securities borrowing and lending). On hindsight, some quarters think the timing would have been be better if IDSS had been introduced before the mid- and small-cap rout early this month. This would have given investors a chance to try the new trading tool. 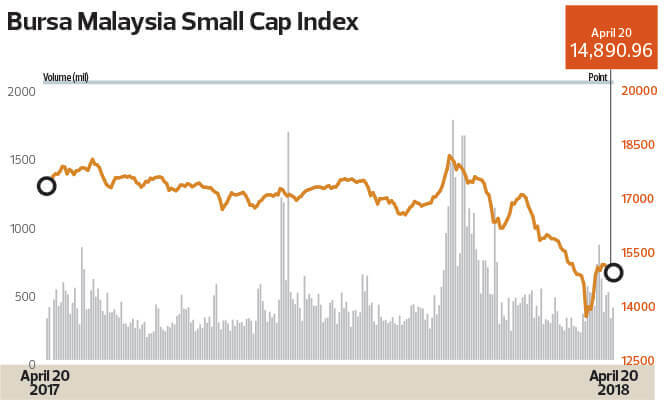 The Bursa Malaysia Small Cap Index, which features all the stocks listed on the Main Market except for the top 100 counters, declined 7.4% from 14,818 points on April 2 to 13,719 points on April 4, before recovering 9.5% to 15,034 points last Thursday. Year to date, the index has declined 12.6%. The 18 new stocks included Excel Force MSC Bhd, JHM Consolidation Bhd, Comfort Gloves Bhd, Hiap Teck Venture Bhd and Luxchem Corp Bhd. These counters have seen their share prices drop sharply from April 2 to April 4 before rebounding in the last two weeks. Hibiscus Petroleum Bhd’s share price dipped from 85 sen to 71 sen before bouncing back to 94 sen.
Lotte Chemical Titan Holding Bhd was also under selling pressure, falling from RM6.01 to RM5.50, before climbing to RM6.23. In other words, investors would have been able to make a tidy sum if they had been allowed to short sell these small-and-mid cap stocks before they plunged. Interestingly, local brokerages contacted by The Edge Financial Daily last week said they had yet to implement a system to offer IDSS to investors. Asked when short selling would be made available, the answers ranged from “very soon” to as early as next month. “There’s no rush [to allow IDSS] if the brokerages don’t see much commercial gain from it,” says an executive with a local stockbroking firm. Besides, most brokers say they have yet to see significant investor interest in IDSS even though it had been announced some months ago. “With any new product, what is needed is education of investors,” says Woon See Soon, senior general manager at Mercury Securities Sdn Bhd, which offers IDSS. To recap, the move to allow IDSS was announced by Prime Minister Datuk Seri Najib Razak on Feb 6 at the World Capital Markets Symposium. Bursa Malaysia said market controls for IDSS include a suspension of short selling if a stock’s price falls by more than 15% from the previous day’s closing price, or if the gross short selling volume exceeds the daily maximum limit of 3% of outstanding shares per security. Given the uncertainties in the global market, equity markets are expected to be volatile. IDSS could be a handy hedging tool when the bears are out in force. That said, a key factor that drives short selling is the availability of sufficient scripts for short sellers to borrow. Short selling is not permitted without shares in hand. Thus, market regulators have to ensure there are decent returns for investors to park their shares for lending. Nonetheless, some quarters opine that the local market currently does not have the depth for active short-selling.